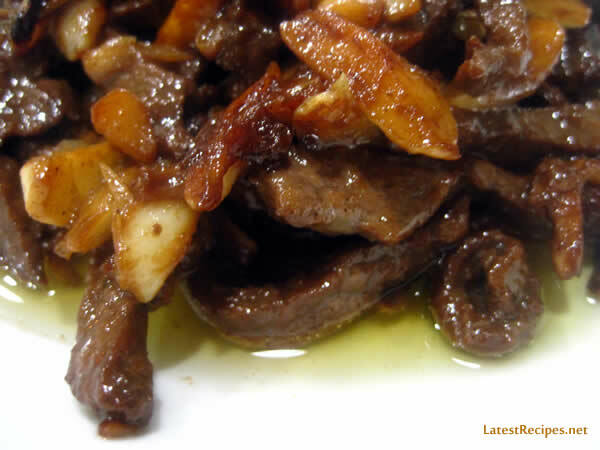 Beef Salpicao is a Filipino dish of Spanish or Portuguese influence. It’s beef tenderloin cut into small pieces or strips and marinated in olive oil and sauteed with garlic..lots of garlic! Really simple and easy and so quick to cook just allot some time for marinating. I like to serve this with our favorite side, sauteed cabbage with turmeric. when ready to cook, saute garlic cloves in olive oil..ooohh..smells so gooood!!! then add the beef mixture, all of it ..
cook until tender and browned..and it’s done! Serve with rice, some veggies, and ice-cold Coke..ahhh life is indeed good! Beef in Extra virgin olive oil and lots of garlic. Combine all marinade ingredients in a bowl, add 2-3 cloves of garlic; mix well. Season tenderloin tips with salt and pepper then add to the marinade, massage meat briefly then let stand for at least 2 hours before cooking. Heat about 2 tablespoon of olive oil on medium heat and saute the remaing cloves of garlic, you can add more garlic if you want to. When it gets fragrant and starts to brown, add the beef mixture ( beef including the marinade). Turn heat to high and continue cooking beef while stirring until browned and the liquid part of the marinade is gone. Taste and adjust seasoning if needed. 3 Responses to "Beef Salpicao (Salpicado)"
This is the best homemade salpicao recipe I’ve tried!! Great beef tenderloin recipe! I can just imagine how good this will be on lots of steamed jasmine rice. Thanks for sharing. Love your blog and all the wonderful recipes! That flavor looks so deep and perfect.